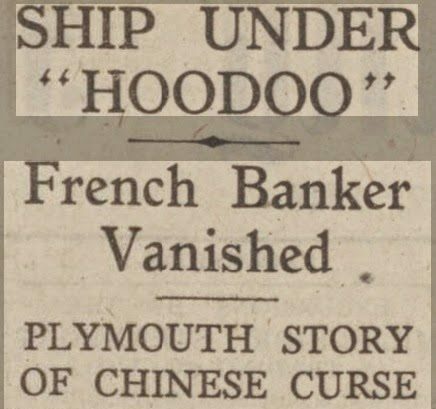 A strange story of a Chinese curse which laid a hoodoo on a ship, culminating in the mysterious disappearance of a French millionaire banker, was told at Plymouth yesterday by members of the crew of the 10,500 tons Glen Line steamer Samwater, which arrived from Vancouver. For six months the Samwater had crossed and recrossed the Pacific, taking cargoes of wheat from Canada to China without incident, until on her last trip M. Henri Bar, 60-years-old president of the Franco-Chinoise Bank in Shanghai, embarked to return to Paris. He took with him 25 crates containing Chinese antiques and treasures which he had collected during his 30 years in the Far East and told fellow passengers and ship’s officers that among them were agate drinking cups looted during the Boxer riots from the Imperial Palace at Pekin, which carried a curse threatening disaster to anyone taking them out of the country. Then began a series of mishaps. First of all, while the crates were being loaded into the ship’s hold, one of them struck and seriously injured a Chinese coolie. 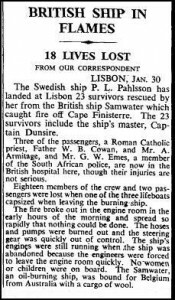 Three days later one of the British members of the crew began to suffer from delusions and, acting on instructions from a warship, the Samwater put back to Yokohama, where the man was taken ashore for hospital treatment. Capt. F. Howe, master of the ship, whose home is at Middlesbrough, said: “The ship never stopped rolling after we left Shanghai until M. Bar disappeared. He left the saloon as usual that night announcing that he was going to retire. “When it was found that his bed had not been slept in we made a thorough search of the ship, but there was no trace of him. It was a dark and windy night and we could only assume that while walking along the deck a heavy wave had washed him overboard. During one trip across the Pacific the Samwater came across the British steamer Empire Ouse which, with 10,000 tons of wheat on board, was lying disabled with a propeller missing. The Samwater took her in tow and in 17 days brought her 3,200 miles across the ocean without mishap to Hong-kong, a feat of salvage which should bring rewards of thousands of pounds to owners and crew. Only 6 months later, on January 31st 1947, the SS Samwater burned and sank off the coast of Cape Finisterre, Spain…resulting in the death of 18 crew members. Steamship SS Samwater Official Number 169923 of the port of London, a flush deck, steel, single screw cargo ship with steam machinery situated amid ships, one triple expansion reciprocating steam engine and 2 oil fired engines. Built in 1943 by Bethlehem Fairfield Shipyard, Baltimore, Maryland, USA as part of the Liberty fleet. Owned by The Minister of Transport and managed by Herbert Gladstone McDavid of Glen Line Ltd Glasgow. She was classed American Bureau +A1(E) meaning the ship was passed perfectly fit and equipped for the perils of the sea when she sailed in January 1947 on a voyage from Freemantle, Australia to Belgium carrying a cargo of wool, concentrates, 38 crew and 5 passengers calling at Capetown on 7th January to take on 750 tons of oil fuel.